The John Deere 42 in. Twin Bagger for John Deere 100 Series Tractors features open-weave polyester bags for better airflow and cut quality. Installation is easy and doesn't require the use of tools. Fits John Deere 100 series tractors with a 42 in. deck. 2 years or 120 hours if purchased with machine. 1 year if purchased separately. 42-inch Bagger for Lawn Tractors The John Deere 42 in. 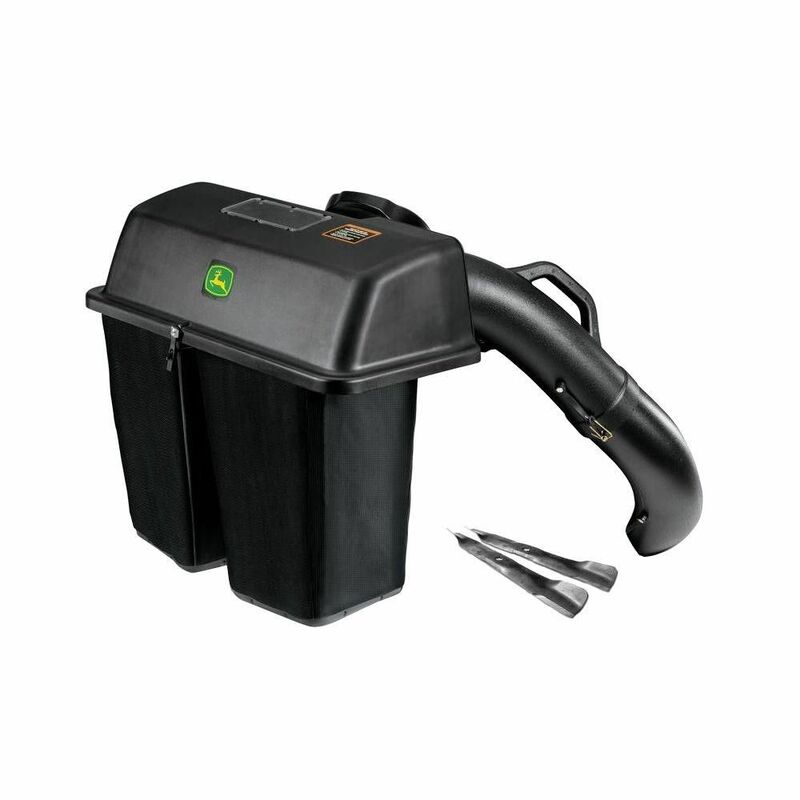 Twin Bagger for John Deere 100 Series Tractors features open-weave polyester bags for better airflow and cut quality. Installation is easy and doesn't require the use of tools. Fits John Deere 100 series tractors with a 42 in. deck. 42-inch Bagger for Lawn Tractors is rated 4.1 out of 5 by 376. Rated 5 out of 5 by JDI from This bagger is easy to assemble! Comes with bagging blades!... This bagger is easy to assemble! Comes with bagging blades! Works great and it's easy to unplug if you get in to big of a hurry!! The bags are easy to dump! !It's like a vacuum cleaner for your lawn!! Rated 5 out of 5 by TKO from Perfect for easy clean up. Great quality, easy to use! ... Perfect for easy clean up. Great quality, easy to use! Thank you for visiting The Home Depot website. No, this 42&quot; Bagger fits John Deere 100 series tractors with a 42 in. deck. Is this bagger compatible with an LA100? Thank you for visiting The Home Depot website. Yes, this Bagging attachment is compatible with the LA120 Lawn Tractor. Is this compatible with the L110 model? Thank you for visiting The Home Depot website. No, this Bagger is not compatible with the L110 Lawn Tractor. Will this bag catcher fit a 2015 John Deere X300 42 inch deck mower ? Thank you for contacting The Home Depot website. This bagger would not be compatible with the X300.